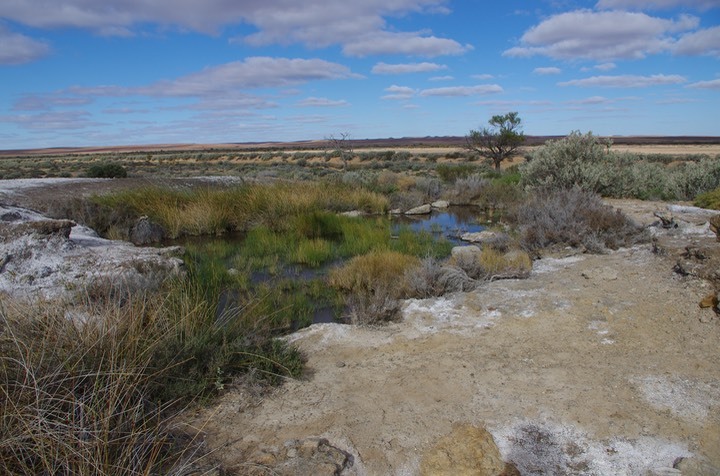 THE GREAT ARTESIAN BASIN springs in South Australia’s Far North arid region are tens of thousands if not hundreds of thousands of years old. Some of the flora and fauna they support are found nowhere else in the world. The springs have long sustained the Aboriginal people of the area, and they made it possible for Europeans to survive and become established in the harsh envirionment. 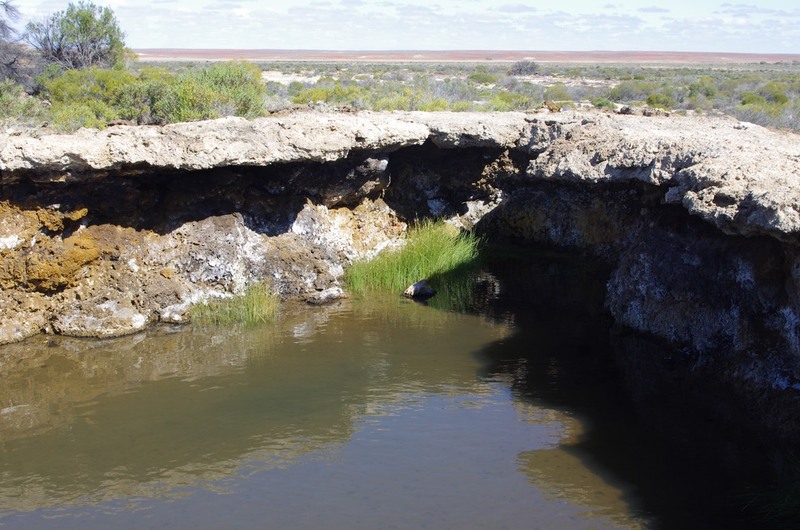 �Repeater stations on the Inland Telegraph were built beside GAB springs, and the Oodnadatta Track between Maree and Poodnadatta still follows a line of springs where the ancient waters of the GAB come to the surface. The cattle stations and the few towns in the Far North are entirely dependent on water from the basin. � So too are the mines, including BHP’s huge copper-gold-uranium operation at Olympic Dam, the Cairn Hill magnetite mine, which is awaiting approval for a major expansion, and the Prominent Hill cooper and gold mine. �As part of a planned expansion of Olympic Dam, BHP is seeking permission to increase its take of artesian water to 50 megalitres a day. Moomba, and the oil and gas industry in the Cooper Basin also rely on the artesian water. The water comes mainly from the high rainfall areas in Queensland. �It percolates across the continent, deep underground, at glacial speed. �It can take thousands of years for water extracted at the South Australian end to be replaced. It has been estimated that since the first water bores were first sunk into the GAB less than 150 years ago, the flows from the springs have declined by 40 per cent. The GAB springs are often referred to as�“mound springs” because over thousands of years minerals in the water has been depsoited at the mouth of the springs, forming mounds which can be several metres in height. Some of the mound springs are now dry, as the pressure in the system has dropped. Colin Harris, president of the Friends of Mound Springs, says the springs are "the canary in the mine” indicating the health of the basin. The CSIRO’s Noble Gas Facility, the only centre in the southern hemisphere capable of accurately testing ground-water up to a million years old, is now fully operational after a �three-year build. Based at the Waite Institute in Adelaide, the facility will help sccientists better understand the effects on groundwater of further developments in regional Australia, including the Great Artesian Basin. In a submission to the Department of Mines and Energy on the proposals to drill and frack for oil or gas in the Arckaringa Basin close to the springs, the Friends of Mound Springs�said that "mound springs of international importance are potentially at risk through the activities proposed by SAPEX, but the information provided in the (initial) Environmental Impact Report is not specific or detailed enough to enable a proper, measured assessment of that risk. "In this situation, the Friends of Mound Springs contend that the precautionary principle should be applied and the SAPEX proposal should not be approved on the basis of the general information provided. That decision could be reviewed at a later date pending the provision of more detailed information." It said it "will assess any potential impacts to communities of native species dependent on natural discharge of groundwater from the Great Artesian Basin . . . �during the Stage 3 approvals process when the licensee provides details including locations of their drilling and fracture stimulation activities relevant to GAB springs”. 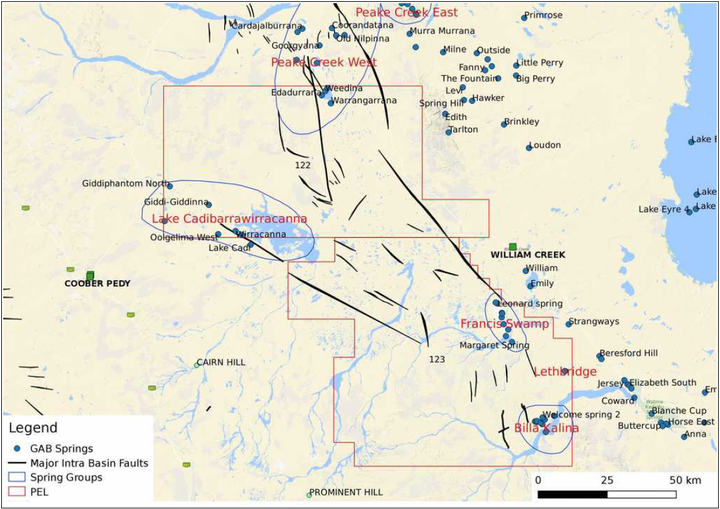 Location of the Great Artesian Basin springs and the SAPEX excploration permits area in South Ausgtralia’s Far North, �extracted from the submission by Coober Pedy geologist Dr Damien Bachmann.